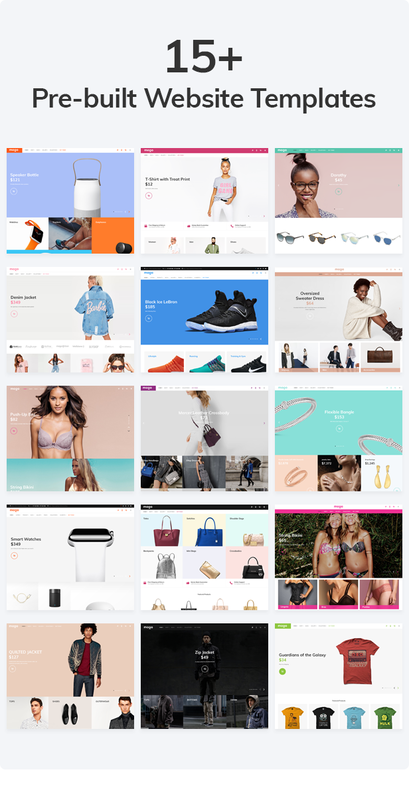 Shopify theme with lots of layouts, features and options so we call it front-end framework for Shopify. Build with love. Try it now. What is the aim of each banner? They should attract customer to visit collection or product page. We offer different modern banners sections. I’m sure you will be able to chose something that will suit your needs and requirements. There is no need to force customer to reload page to view filtering results. Everything is done on the same page without reloading. Your customers will not leave collection page and will be able to filter desired products in the easiest way. Boring page switchers is not about our theme. You can have unlimited “load more” feature. Usually we earned on customizations by adding this feature to the client’s websites. Now we decided to make it as part of the theme. This is also must have feature for any good store. This feature is inbox. Sensitive ajax search allows to find product if you have minimum information about it. You don’t need to wait and reload search page. Ajax search is intended to make search simple and easy. Default filters are the strong part of basic Shopify software. We have separate module for this purpose. Working with filters will be very easy. Don’t limit your opportunities to organize your products in the best way. Advanced color, size, material swatches is also part of our custom app inside the admin. Improved UI, nonstandard approach will satisfy your business needs and requirements. 6 Types Customizable Product Category Page. Every one should have choice. We gathered most popular collection pages. Our predefined listing pages are different, flexible, informative and nice. 2 Types Customizable Product Info Page. Basic default Shopify doesn’t have such feature. Some our competitors sell this app as separate module. In our case this feature is the part of the theme. You don’t need to pay extra for its usage. Enjoy wish list functionality. I can’t imagine well done online store without this feature. Users like to compare products and we are providing this functionality. Lets give customers the opportunity to chose what product to buy. There is no matter what will they buy. Am i right? Each client should have the opportunity to view product details without entering and being redirected to the product page. Customer can save his time by viewing product details using quick view option. Sometimes products may contain custom information and description. For this purpose we added extra functionality to have custom unique tabs for each product. You can have also general tabs for all online store and combine them with custom tabs. SEO optimized. Product Rich Snippet. Tested by moz.com app. Don’t limit your imagination with predefined color scheme. You can choose any color with color picker. Elements will be updated automatically. Our admin allows to adjust almost all elements according to your specific custom requirements. True Sections. 19+ Sections. Hundreds of Options. Unlimited Combinations. Sections is one of the progressive features in the latest Shopify updates. This is some kind of builder where you can organize structure parts of the website according to your desire. You can add, delete, sort blocks. Header. 12 Pre build Layouts. Sticky Header. Footer. 6 Pre build Layouts. Big, small, informative, clean, dark, bright, with logo, without logo, with newsletter, without newsletter, tall, thin, with social networks, without them, with meta navigation and without it. Do you know other variants? Of course this is must have option. Review our demo with RTL feature. You can adjust your web store by one click option through the admin. This is so easy. We organized our demo in six languages – English, Spanish, German, French, Arabic and Portuguese. Of course translations aren’t prefect but our aim was to show that our theme can be localized to any language. You will not find such feature among our competitor. Strong JS knowledge provides best UI/UX for our customers. Sticky sidebar allows to scroll listing/collection page and have filters on the left side always in visible zone. This feature was available in Magento CMS. Basic Shopify software hasn’t inbuilt options. Our theme is integrated with this functionality and you can choose whether to have left, right columns or to have layout without them. About us, 404, contacts, blog, gallery, services, FAQ, site map, coming soon and much more. You will find everything that you need for functional eCommerce web store. At first we had some doubts whether to use bootstrap 3 or 4. But we decided that latest actual bootstrap version will be better for our project and for using by our customers. Of course this is not Visual Composer for WordPress, but we have tried to create our theme using best practices and allow customer to combine different blocks and structures. Create your own layout! Build with Slate – Tool for Developing Themes. Slate tool latest and best tool for theme development. 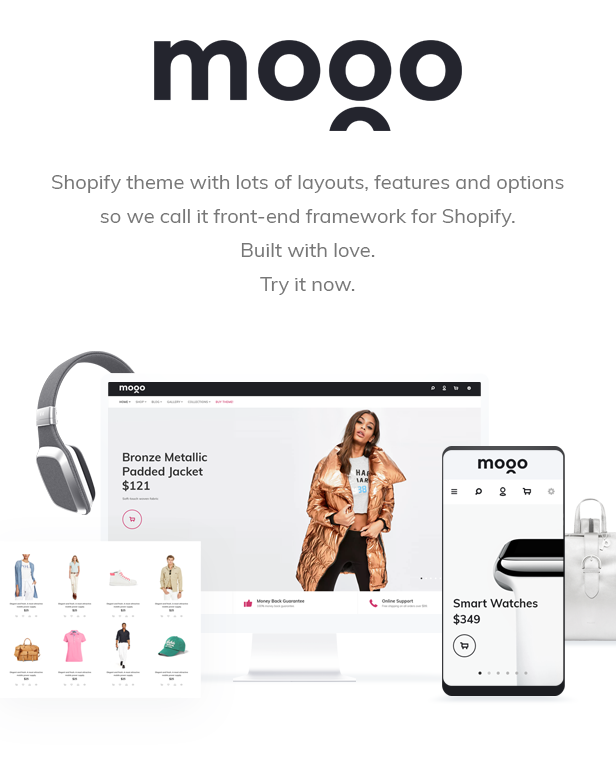 It is designed to assist your development workflow and speed up the process of developing, testing, and deploying themes to Shopify themes. Bootsrap With Flexbox Grid. Quickly manage the layout, alignment, and sizing of grid columns, navigation, components, and more with a full suite of responsive flexbox utilities. Sass technology is the most mature, stable, and powerful professional grade CSS extension language in the world. Our theme is created based on SASS. - add option "Sticky effect"